Learn the basics of traditional metalsmithing techniques of jewelry making in 5 hours. This skills-based class takes you step by step through the techniques of sawing, filing, stamping, surface texturing, sanding, polishing, and soldering. All supplies, such as brass and copper metals are provided. Students may bring in their own materials with instructor approval. The studio is only equipped for non-ferrous metals. 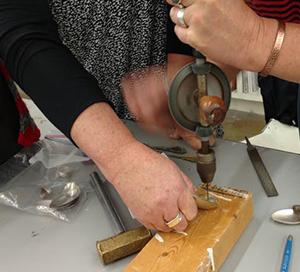 This beginning workshop is the prerequisite for the weekly advanced jewelry making class. Bring a bagged lunch. This is an all-day jewelry intensive.